Megalytic provides a Client Dashboards feature that enables you to provide your client’s with real-time online access to their reports. If you want to white label your client dashboards, so that they run under your own domain, these are the steps you need to follow. 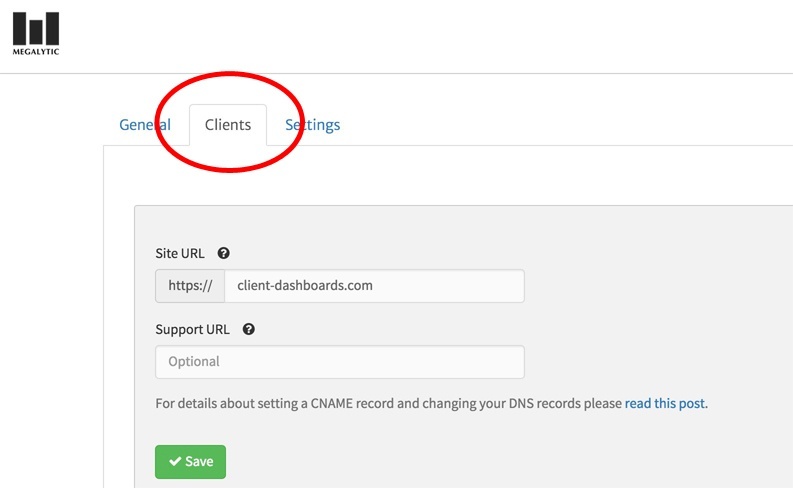 Create a CNAME record in your DNS account that points your domain to client-dashboards.com. Provide us with an SSL certificate for your domain. Update the Site URL (and optionally the Support URL) on the Clients tab in the Management Section of Megalytic. Each of these steps is explained below. First, you need to log in to your DNS hosting provider. Once logged in, you need to create a CNAME record that points the domain where you want to host your dashboards to client-dashboards.com. The method for creating a CNAME record varies by DNS hosting provider. Once you are logged in to your DNS hosting provider, locate the page for updating your domain’s DNS records. It might be called something like “DNS Management”, “Name Server Management”, or “Advanced Settings”. Once you are on this page, look for a button or link that says something like “Add Record”, “Create Record”, or “Create CName Record”. Click that button or link to create a new record. Where it says “Name” you will enter the name of your domain. Where it says type, you will select “CNAME”. And for the value, you will enter “client-dashboards.com”. For example, suppose that you own the domain greatmetrics.com and that you want to host your client dashboards at dashboards.greatmetrics.com. Then, you will need to log in to your DNS hosting provider for greatmetrics.com and create a CNAME record for the subdomain dashboards.greatmetrics.com that points to client-dashboards.com. The image below shows how this is done in the DNS hosting service provided by Amazon Web Services called Route 53. The name of the domain that you want to use for hosting client dashboards. In order for Megalytic to securely host your client dashboards using the domain that you have specified, we need to use SSL. And in order for us to run SSL on your domain, we need for you to provide us with an SSL certificate for that domain. To send the SSL certificate to us, please submit a help request stating that you want to set up white label client dashboards and you are ready to send over the SSL certificate. We will ask you to send us the 3 files that we need to install on our Apache server: Private Key, Intermediate Certificate, and Primary Certificate. You can simply include these in the help request, or send them to us in an email after we respond to your help request. These files typically look like the examples below. If you need help getting an SSL certificate for your domain, or finding these three files, check with your network administrator or webmaster. If you are a small organization and do not have anybody with experience procuring SSL certificates, please let us know and we’d be happy to help. Just submit a help request asking for help getting an SSL certificate for white label client dashboards. Once you have sent us the SSL certificate files and we’ve installed them, then you can update the information in your Megalytic account to point your client dashboards to your domain. First, click on the “Clients” tab on the Management Section of Megalytic. Now, replace the text “client-dashboards.com” int the Site URL field with the domain where you want to host your client dashboards. Click “Save” to save the changes. Here’s what it would look like for the example domain we’ve been using: dashboards.greatmetrics.com.